McCall 2335 -Dragon costume. I used Poly Taffeta from Joann’s, fleece, hi-loft batting instead of fiberfill. DS wanted to be Godzilla for Halloween this year so I found this pattern and immediately looked up reviews. I needed to see what I was in for! In all, it was a well drafted pattern with the exception of the arm and leg length. I have one of the tall kids in class but I still had to remove 4” from the sleeves and 3” from the legs. I wasn’t planning to put elastic at wrists and ankles so I shorted the pattern pieces with that in mind after quickly pin fitting him. The instructions were crazy. If I had constructed the costume in the order given it would have taken me all month. It did take the better part of a few days as it was. I grouped like tasks together like constructing all the spiney parts at once instead of at the point where it would be attached to a body part. The instructions had the tail attached to the back bodice immediately but that sounded like a lot of wrangling at the machine to get around that tail. I constructed the body as much as possible before attaching the tail. I knew the tail would be heavy so I wanted to keep it from pulling the back down and choking my poor little guy. I ran a length of 1/4” elastic from the inside tip of the tail and pulled it taut as I attached the tail to the back bodice. Then I measured his chest and cut 3/4” elastic to fit around his torso, bringing up the 1/4” elastic and attaching it. Once the contraption was pulled snug up under his armpits, voila! No more major tail problem. I also knew the tail would get ruined from walking outside and I was right! I need to replace a large portion of the tail. 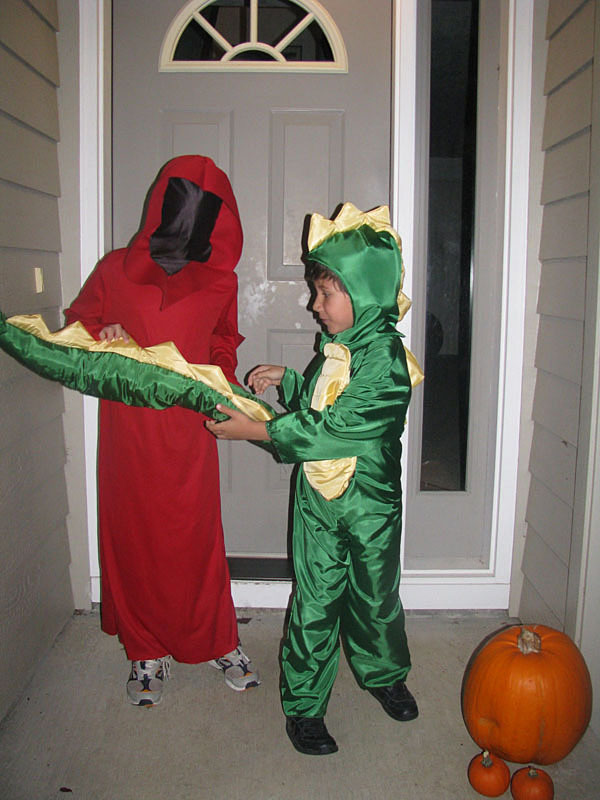 Warding off scary trick-or-treating brother to protect damsel with camera. Thank heavens I will never need to sew another one of these, however, I do recommend it to others. It really turns out a cute costume! So many trick-or-treaters called out to DS to say how cool his costume looked. He even got double candy from a few houses because of the green and yellow Oregon Duck colors. Yep, that was the idea! You did a great job on this! I love the way it turned out. Super Mom for sure!! Great costumes. 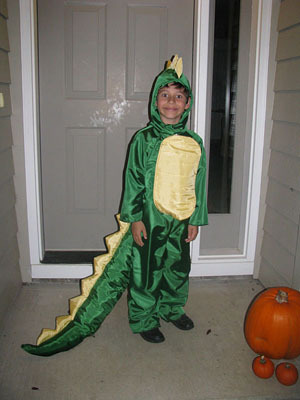 I am making this costume right away, I wish I found the elastic in the tail trick before I made it. I did follow the pattern as is, realizing as I went to sew the inseam (the step right after sewing the tail) that the tail should not be the first thing to put on. You are right, very cumbersome,especially in a really small workspace.